No matter how experienced, talented, famous and original you are as a DJ there are some people who, despite having a very similar music career, will regard their musical talents as far more superior than those of a DJ! They believe that the level of skill required to be a DJ is not worthy of the title 'musician'. Some musicians and music connoisseurs regard DJing to be so inferior to all other types of music making that they won't acknowledge it as a true musical art form. This type of 'musical fundamentalism' is passionately splashed all over social media with very little grey area. There are those who are for and those against. I came across one comment on a music blog that suggested DJ decks could be considered to be a type of instrument and the response was incredible. Anyone who attempted to class a DJ as a musician was bombarded with a shower of disagreeable distaste. While most comments defending this view thought nothing of describing their decks as an instrument just like any other instrument used by someone playing music. Some people just didn't seem to recognise any skill in the way a DJ plays due to their reliance on technology to play and mix together other peoples pre recorded music. According to online searches and social media, where we once use to read and write blogs on our favourite bands we are now seeing DJs such as Martin Garrix, Marshmello and Calvin Harris in their place. 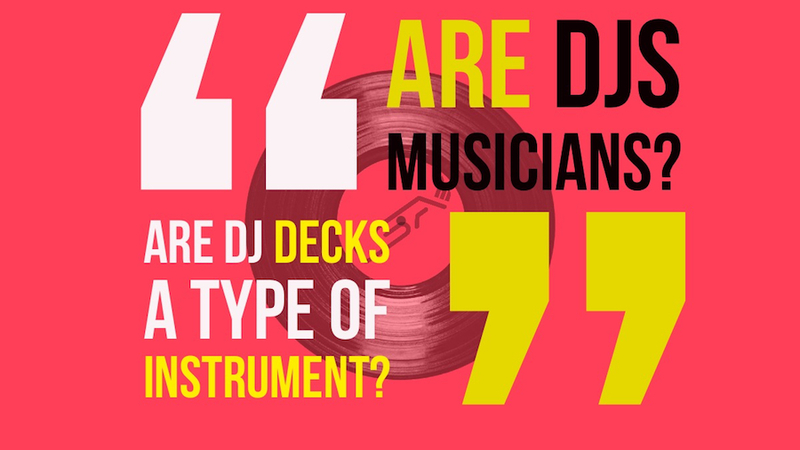 Making DJs the most talked-about musicians online; which begs the question. Why is it that DJs still struggle to command the same respect as other types of talented musicians? You wouldn’t approach a violinist when they are mid way playing a song to ask “Can you play something a bit more edgy” or to inform them that "Just because you're rubbing some strings together doesn't make you a real musician,”! But these comments are very typical for DJs every time they play a set. One of the worst things you can do to a musician playing live is to interrupt them during their performance. A DJ who approaches their sets with a sense of creativity and originality can achieve a stand-alone musical work of art equal to that of any other musician! So it only seems right that a DJ is treated the same as any other musician. People who approach the DJ booth with their requests should be treated case by case. Not all requests are intrusive or insulting but every DJ needs to be prepared to say "no" without getting pulled into a heated exchange of words. DJ Etiquette should always come first but you also need to know how to deal with troublemakers when they approach you during a set. Here are 5 types of 'fantagonists' who tend to approach the DJ booth and 5 ways you can politely deal with their requests so they disappear. 1~The Flirt – Many DJ's will be very familiar with the 'flirt request', and for most of you a drunken wink and a bit of naked flesh isn't gonna change your mind about playing a request track in your set that is totally out of place. If the request is a good one and they are hot as hell, by all means flirt back but if this isn't the case make sure you politely explain why you can't play their favourite track in your set so they don't take it personally and get all insecure. If the request is bad and they are hot as hell, be strong, because you don't want to destroy a perfect set, no matter how gagging you are to get laid! Realistically they are unlikely to reward you for playing their track with a night of passion. In fact it's more likely that they will hook up with your best mate instead. 2~The Hand Greeting of Death - This is a greeting every DJ should fear and if possible avoid encouraging. He loves your set and wants to show his appreciation in an overly enthusiastic manner. Its like he has some Matrix style moves because they seem to comes at you from all directions with their hand extended for either a handshake or fist bump and before you can say "mind the equipment" they have somehow disconnected the power and knocked the most expensive item of equipment onto the floor.. if you can bare to watch you can see a couple of examples here in the video clip above DJ Fantagonists. 3~The Drunk – The audience wouldn't be impressed with a drunk DJ and it can be equally unimpressive when the DJ has to put up with a drunk fan. They will come back to tell you the same story again and again no matter how many times you tell them to 'do one'. If you entertain their behaviour in anyway you may as well ask them to hang out with you for the duration of your set. If your show them how you truly feel about their attentions then you run the risk of getting into an unwanted altercation. A distraction technique is the most effective response in this situation. Send them off on a wild goose chase by telling them that someone is handing out free drinks tokens at the other end of the club. 4~The 'It's My Birthday Today' Request – Casually ask them a bunch of date and year related questions they would know for sure if it were in fact their birthday! As they stumble over their words and search for the nearest exit tell them you have 'Happy Birthday' on vinyl and you'll be playing it asap no argument. Suddenly their fear of messing up the math won't be as embarrassing as the thought of everyone looking in their direction and singing them a fraudulent happy birthday! 5~The Imposter – If someone has to spell out who they are or big up what they do the chances are they are pretending to be something they're not in order to impress you or to endulge their ego. If they are a real DJ they would know not to approach you during your set. Often this sort of boasting or achievement embellishment is fairly harmless but if you want to get rid of them fast quiz them about where they play etc and bombard them with lots of technical jargon so they make a faux pas, get shy and disappear.